Includes schematics, service procedures, & Diagnostic ROM info. This final version offers operation in OMNI & POLY Modes over 16 MIDI channels with program select, pitch & mod wheels, and the ability to dump program data via MIDI. It also provides a fix for the problem of NOTE ON Droning caused by exposure to running status bytes via MIDI. The Version 8 ROM is easy to install, no soldering needed. 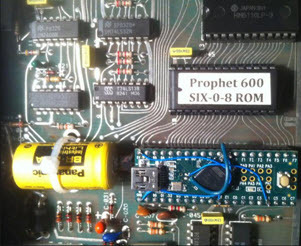 To visually confirm your Prophet's operating system version, you must open up the P600 & check the version level on the ROM's label. The highest level is "SIX-0-8". The ROM is located on the left/bottom panel PCB, near the battery (at the 5 o'clock position off the battery). The VCF cut-off frequency can also be controlled via MIDI using an auxiliary output of a Kenton MIDI-to-CV converter.